A lot of discussions are woven around how a company’s Leadership plays a key role in Six Sigma. This is because the entire success of a Six Sigma project lies in the support and interest of Top management. Top Management has a huge responsibility in driving the Six Sigma culture in an organization. It is a proven fact that bottom line benefits of Six Sigma Projects targets on improving the revenue of an organization and sustains these benefits over a longer period of time. Whenever we talk about increased profits, Top Management definitely needs to participate as ignorance may result in huge financial or business impact (when customer requirement is linked with any improvement projects). Why should Six Sigma be given such a high importance by your Leadership? It is because Six Sigma is much more than individual projects. Leadership should recognize Six Sigma as a management strategy, rather than using it as a tool. When a company adopts Six Sigma as a management strategy, the entire organization and all its departments will be channelized towards identifying and improving its processes. The benefits reaped will be huge compared to individual projects’ cost savings. There are a lot of companies that have reaped huge revenue savings by adopting Six Sigma as a management methodology and driving Six Sigma culture in the organization. How does a successful organization adopt Six Sigma into their management strategy and culture? Below are some quick tips and must-to-do’s for successful adaptation of Six Sigma. 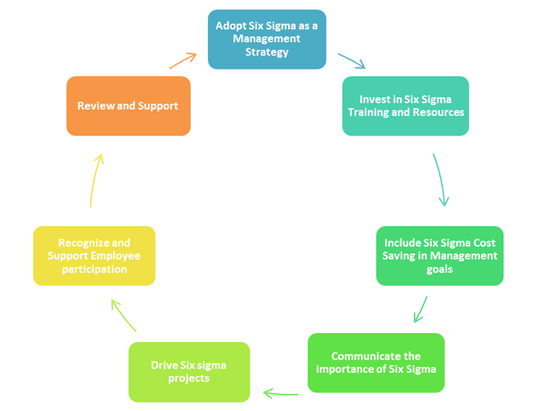 Investing in Six Sigma Training and Resources: For successful implementation of Six sigma methodology the first step should be to hire trained and experienced Six Sigma resources (Probably Six Sigma Master Black belts & Black belts), and then train different levels of management in Six Sigma methodology. Top management should ensure there are adequate staffs in Six Sigma roles to drive Six Sigma. Include Six Sigma Cost Saving in Management Goals & Review: Along with other goals fixed for each department, Six Sigma cost saving should also be a management goal, which top management should review in each meeting. Thus, the employees will also start to see Six Sigma methodology as a part of their responsibility and start identifying project opportunities. Communicate the Importance of Six Sigma: Top management should let the employees know that Six Sigma is an important goal, and that the leadership views it as an important parameter in its business. Posters, email communications, addressing employees about their concerns related to Six Sigma adoption, and providing clarity on each one’s role in Six Sigma journey are some ways to communicate the message strongly to employees. Drive Six Sigma Projects: Management should create Six Sigma champions, who will identify projects and allocate resources for the projects. There should be intervention from the leadership when there are bottlenecks in the progress of projects. Also, leadership should conduct periodical reviews on the progress of projects. Recognize and support Employee Participation: The KPIs and responsibilities of the employees should include contribution towards Six Sigma journey. Apart from this, leadership should identify ways and means to identify extraordinary participation by employees and reward them accordingly. This will motivate other employees to work towards the Six Sigma initiatives. Review and Support: As the organization progresses in the path of Six Sigma strategy, the policies and rules framed at the beginning of the journey may need reviewing and modification. Leadership should identify these changes and ensure that the journey is in the right path and at right pace. Thus the role of Leadership in Six Sigma is a huge and very crucial task. At every stage in Six Sigma journey, Leadership has a significant contribution, failing which may not lead to planned benefits in terms of Cost saving, revenue, customer satisfaction, employee morale and so many other parameters. The approach and time taken to completely channelize the organization’s efforts towards Six Sigma, may vary depending on an organization’s size, employee profile, organization culture, age of the company and so many other parameters. Given all these variations, management commitment is a key parameter that will lead any type of organization to success. This holds good not only for Six Sigma implementation, but for any new initiative and change management.